Residents at Glengarry, Aberdeen and Mt. Tolmie extended care homes will enjoy a little 'extra' this Christmas thanks to the generosity of the Odd Fellow & Rebekah Extended Care Hospital Committee. Tom Smith and Betty Miller presented a cheque for $1,200.00 to Eldercare Foundation Executive Director Lori McLeod on December 5, 2008. This generous gift will enable the Foundation to provide festive treats and entertainment for the enjoyment of the elderly residents this Christmas season. 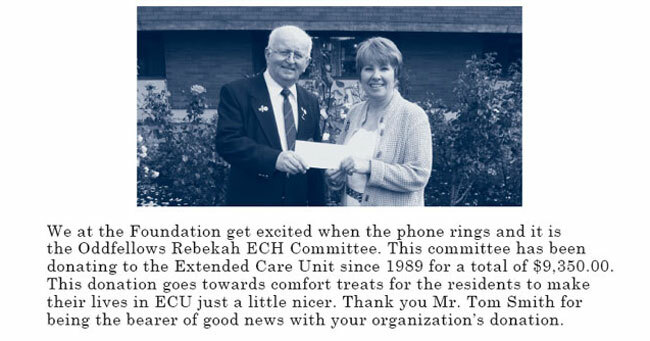 "Since 1990 the Odd Fellows and Rebekahs have donated over $25,000.00 to purchase special 'extras' for the residents." said Lori McLeod "They visit us twice a year allowing the Foundation to spread extra joy both at Christmastime and in the Spring. Their dedication to enhancing the lives of elderly extended care residents is ouststanding."